Score a home run by going to a sports school and still earn a bachelors degree that pays. Find out which sports colleges produce the highest-earning graduates. Salary data for alumni who earned a bachelor's degree and did not go on to earn any additional degrees. Salary data for all alumni who earned a bachelor's degree, including but not limited to those who went on to earn additional degrees from any school. College isn’t just about academics. Sure, studying is important, but there are other aspects of college life that draw students to particular universities. For many die-hard sports fans, a strong football or basketball team can be a major factor in college selection. 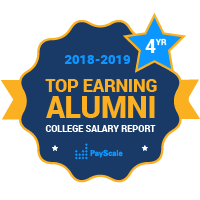 The PayScale College Salary Report ranks the country’s top schools with Division 1 basketball or football programs by alumni salary so that you can find a college with high earning potential and a winning record. Harvard is known for its world-class academics, but it’s also the home of some excellent athletes, like basketball star Jeremy Lin and NFL quarterback Ryan Fitzgerald. The Harvard Crimson prove that athletic and academic excellence can coexist, and they top our list of the top schools for sports fans by salary potential. The United States Naval Academy (USMA) at Annapolis faces off in the big Army-Navy game every year, they can at least gloat over the fact that the Navy crushes the United States Military Academy (USMA) at West Point, where alumni earn a median mid-career salary of well over $100,000. Other surprisingly high-earning schools famous for their jocks include the Georgia Tech Yellow Jackets, the Cal Bears, and the Fighting Irish of Notre Dame. If you were to judge some of the most famous college sports rivalries by the highest-earning graduates, you would see Duke’s Blue Devils beat the University of North Carolina Tar Heels; the Texas A&M Aggies beat the University of Texas Longhorns; and the USC Trojans beat the UCLA Bruins.